All the best from all Callants' Club members to Cornet Gareth Renwick and Lass Jennifer Nichol, Acting Father and Mother John and Lynn Lyle. Winners of the schools essay competition, High School prize winners and the Common Riding Shop Window Display competition. The Annual Dinner for 2018 was held on Friday 2nd March in the Hawick Rugby Clubrooms. The guest was David McVittie, and a full report can be found here. The Club have been contacted by Dianne Laing of Archaeology Scotland for help in turning Stobs Camp into a Heritage Site by 11 November 2018 with links to Hawick Archaeological Society. If any members have recollections, etc., on Stobs Camp, again please contact the Hon. Secretary. The following photos are reproduced by courtesy of ILF Imaging, Sandbed: website main photo showing the Cornet and his followers; Derick Tait presenting robes to Stuart Marshall; Cornet on Hawick Moor. A central section of this website is a comprehensive essay on the Common Riding: its traditions and origins. This was first written in 1983 by the Callants Club and Ron Taylor, and has been revised over the years as things have changed. It remains the definitive guide to Hawick Common Riding. The essay comprises 18 chapters; it covers all ceremonies and traditions; and is an invaluable and easily-read reference. Kenny McCartney is the 2018 President. In this article you can read a brief history of Hawick and its colourful past. 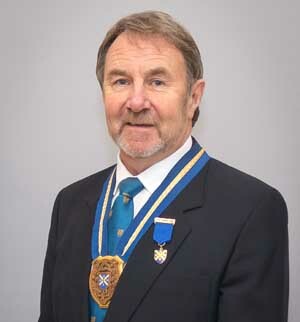 Written by renowned local author Ian Landles, the article describes in a nutshell what is special about the town of Hawick.